Feliz día de la Mujer! Happy Women's Day!!! HOY lo celebramos inaugurando nuestra Exposición Internacional gran formato en honor a Catalina de Salazar, mujer de Cervantes, en el magnífico Convento de los Capuchinos en Esquivias, Toledo. 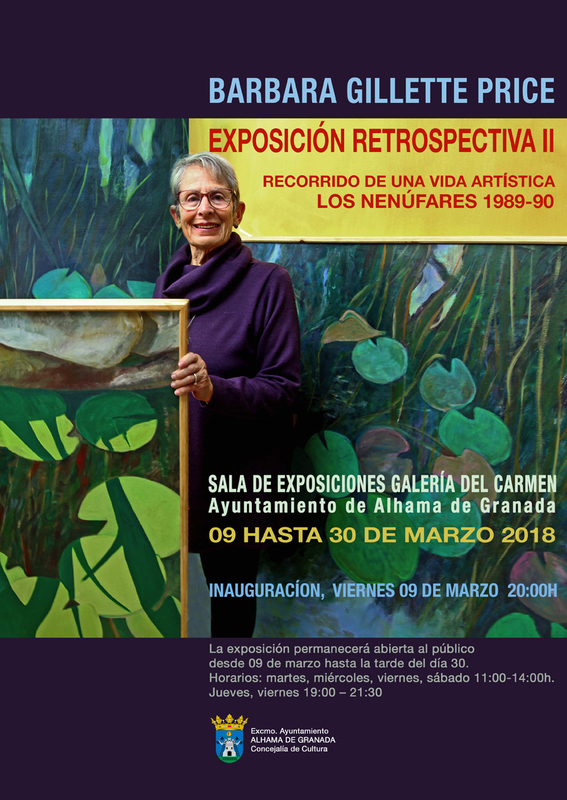 La exposición se podrá ver hasta el 30 marzo. We'll be celebrating the Opening Art Exhibition at Convento de los Capuchinos, Esquivias, Toledo 6pm. The solo exhibition ran for two weeks (Sept. 14 - 30, 2018) at the Galería del Carmen in Alhama de Granada, Spain, featuring 20 works on paper and drawings. Barbara Gillette Price is the most recent recipient of the “Christopher E. Burke Fine Art Grant” for excellence in her approach and quality in the visual arts. This grant is awarded as part of our exhibitions at Gallery 25N and is provided to visual artists worldwide. As I continue to create and show new work, as well as exhibit work from my archives, I will update this blog with news. "Shades of Green 2018" An Online Group Exhibit will open at "Gallery 25N" on June 29, 2018 with works from twenty contemporary international artists. GALLERY 25N IS PROUD TO PRESENT THE EXHIBIT "Shades of Green 2018." Twenty International artists have joined us in this unique exhibit, which focuses on their inspiring creative applications of the color green. An interview with painter Barbara Gillette Price at the opening of her exhibition "Metáforas Colorado" in Alhama de Granada, Andalucia, Spain.